CTBaker in the Acres: First day of School! I'm not sure who was more excited...me or the boys. Sam proudly started 4K at Kilbourne Park. He LOVES his new teacher and his new classroom. Fulton will being going a couple of days a week. He too appeared very excited. He really likes his teacher as well. I was concerned about the drop-off drama but there was none. 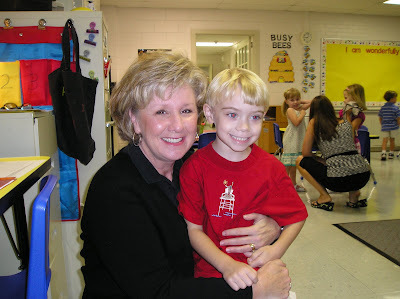 His class was on the playground to make the transition from Mommy to teacher easier. In fact, he ran right in and got on the slide and I couldn't get a pic of him with his teacher. I figured I better leave well-enough alone. More to come on the school adventures.